The latest data released by the Global Wind Energy Council shows that the wind energy industry installed 51.3 GW of new capacity in 2018. Since 2014, the global wind market’s growth has been stable, installing above 50 GW of new capacity each year. 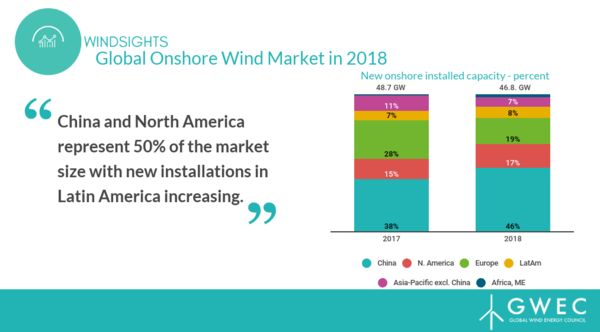 Despite a 3.9% decrease in the global onshore market in annual terms, there was promise shown by growth in developing regions such as Latin America, South-East Asia and Africa which were responsible for 10% of new onshore installations in 2018 (4.8 GW). GWEC forecasts that new installations will reach 55 GW or more each year until 2023. Stable volume will come from mature regions in Europe and the US, whilst significant growth is forecast to be driven by developing markets in South East Asia and the global offshore market. Total installed wind capacity reached 591 GW at the end of 2018, a growth of 9.6% compared to the end of 2017. Total installed onshore wind grew by 9%, whilst total offshore wind grew by 20%, reaching 23 GW. 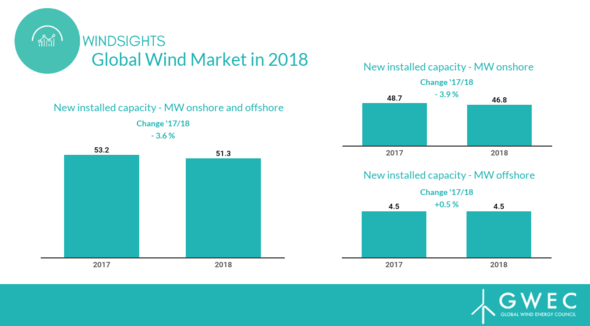 New installations of 4.49 GW in 2018 led the global offshore market to grow by 0.5%, reaching a total installed capacity of 23 GW. 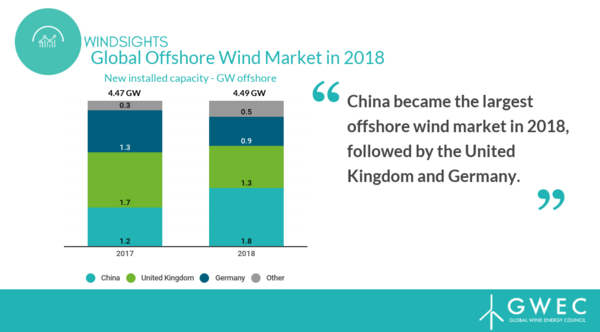 For the first time, China installed more offshore capacity than any other market (1.8 GW), followed by the United Kingdom (1.3 GW) and Germany (0.9 GW). GWEC forecasts that offshore wind will become an increasingly global market. If governments remain committed, and projects and investments continue, annual installations in Asia could reach 5 GW or more each year. In the US, GWEC expects the developing offshore wind market to reach 1 GW by 2022 - 2023. These latest figures released by GWEC form the statistical release of the Global Wind Report which will be released on 3 April.